Green Day on July 15 in TS Schools under Telangana ku Haritha Haram(THH)/ Instructions for Implementation of Telangana ku Haritha Haram(THH)/HARITHA PATASHALA- HARITHA TELANGANA/ Observing "Green Day" on July 15/ Green Day Activities/Haritha Haram Largest Green Drive In India/Green Telangana- Green Schools Program: Instructions for implementation of Telanganaku Haritha Haram in all Education Institutions and observe "Green Day" on 15.07.2017 and also prepare action plan for each and every Institution. Government of Telangana introduced "Telanqanaku Haritha Haram (THH)" a flagship programme of the State Government envisages to increase the tree coverage in the State. The strategy is to achieve the above objective by undertaking massive plantation programme in every possible open space outside the forest and take up intensive rejuvenation and regeneration works coupled with soil and moisture conservation in the degraded forest areas throughout the State. 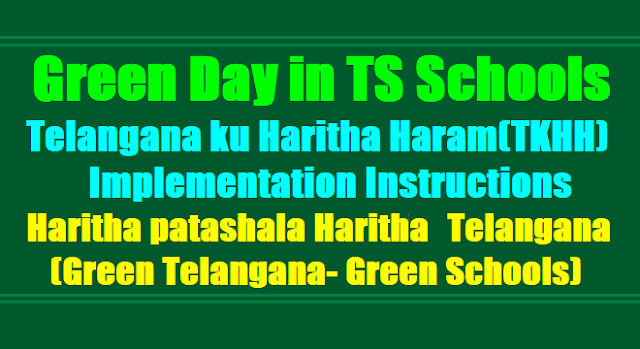 Sub: School Education - THH - Preparation for 2017 planting under Telanganaku Haritha Haram - Observing "GREEN-DAY" in all the Educational Institutional in the State on 15.07.2017 -Instructions issued - Reg. 1. Govt.Memo.No.1145/SE.Genl/Al/2015, dated:16.08.2016 along with Circular Memo.No.1120/For.I (2)/2015, dated :08.08.2016. 2. This office procs.Rc.No.77/PS2-1/2015, dated: 22.08.2016. 3. This office procs.Rc.No.77/PS2-1/2015, dated: 25.05.2017. 4. Memo.No.1120/For.I (2)/2015, dated:14.06.2017 from the Spl. Chief Secretary to Government, environment, Forest, Science and Technology Dept, Government of Telangana, Secretariat, Hyderabad along with a copy of Lr.No.9521/2017/SF-III, dated:07.06.2017 of the Principal Chief Conservator of Forest and Head of Forest Force, Aranya Bhavan, Hyderabad. 5. This office Proc.Rc.No.77/PS2-1/2015, dated: 21.06.2017 & 05.07.2017. All the District Educational Officers in the State are informed that the Government of Telangana introduced "Telanqanaku Haritha Haram (THH)" a flagship programme of the State Government envisages to increase the tree coverage in the State from the present 25.16% to 33 % of the total geographical area. The strategy is to achieve the above objective by undertaking massive plantation programme in every possible open space outside the forest and take up intensive rejuvenation and regeneration works coupled with soil and moisture conservation in the degraded forest areas throughout the State. 1. Observe "Green Day" in all the Educational Institutions under all Managements on 15.07.2017. 2. The slogan for the Plantation in Education Institution i.e., on 15.07.2017 shall be HARITHA PATASHALA- HARITHA TELANGANA. 3. On "GREEN-DAY" the following activities shall be taken up. a. 08.30 AM to 09.30 AM - Arrange rallies and processions in the habitation / village / Gram Panchayat / Ward to create awareness among the general public to grow more plants. b. 09.30 AM to 10.30 AM - to take up Plantation in the school premises by all the staff and students. After plantation take a pledge by all the staff and students. c. 10.30 AM to 12.30 PM - conduct competitions to the students at School Level on THH programme, ie., Essay writing, Elocution etc., The winners shall be given prizes on 15th August, 2017 and a certificate of Haritha Mitra. 4. Constitute a "Green Brigade" with students and teachers to protect the plants in every school. 5. To give priority for "Block Plantations" wherever feasible. 6. Take up multi-row plantations in 4 to 5 rows all along the compound wall, if the "Block Plantation" is not feasible. 7. As far as possible, only Tall plants (3 - 5 feet) are to be selected and they should be preferably drought resistant - flowering, fruit bearing and shaded plants. 10. Ensure participation of Elected Representatives in large number in plantation programme on Green Day (15.07.2017). 1. 14-7-2012 సాయంత్రం వరకు A.P.O & FIELD ASSISTANT సహాయంతో ( 50 గుంతల కంటే ఎక్కువ ఉంటే) గుంతలు పూర్తిచేయాలి. 2. " గ్రీన్ డే "
6. 15-08-2017 నాడు బహుమతులు అందచేయాలి. 8. హరితహారం లో BEST TEACHER కు బదిలీలో కొన్ని POINTS కలుపబడును అని ఉన్నతాధికారులు తెలియజేశారు. 9. హరితహారం లో BEST TEACHER, BEST STUDENT, BEST SCHOOL SELECT చేయబడును ప్రభుత్వం చే అవార్డు ఇవ్వబడును. 10. విద్యార్థులచే "హరితరక్షణ కమిటీ" ఏర్పాటు చేసి గోడల పై వ్రాయించవలెను. (b) Technical support - generation of estimates, identification of wage seekers and payment of wages (Musters, M. Books) for maintaining of plants. 12. In respect of Educational Institutions in Urban areas, the District Educational Officers shall coordinate· with the Municipal authorities concerned for logistical & technical support for plantation in Educational Institutions. 13. All the students should be motivated to take plantation in their house premises and localities. 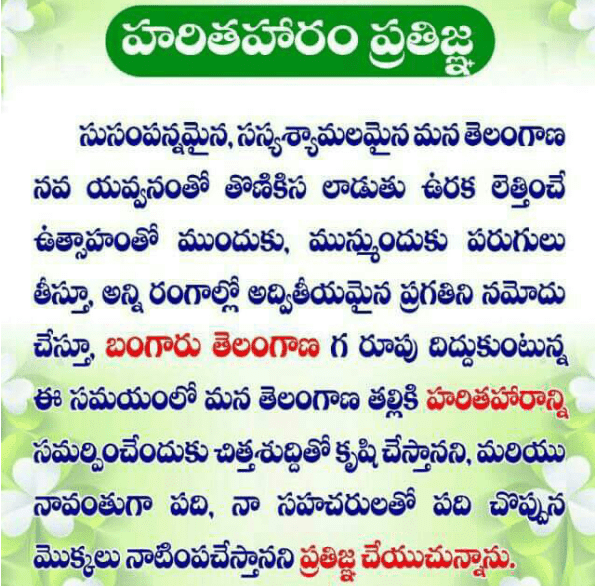 In the context of above, all the District Educational Officers in the State shall issue necessary instructions to all the Head Masters / Principals of all Educational Institutions in the State under all Managements to make arrangements well in advance and organize "GREEN DAY" in all Educational Institutions on 15.07.2017. They are also requested to obtain school wise report through the MEOs and submit a detailed report on "Green Day" by 20.07.2017 without fail. Further, they are instructed to initiate action against the institutions for deviation of instructions issued above and submit Action Taken Report.